The idea for the instant stuffing came from the marketing department of General Foods but the research and development team had to create the product. The test kitchens, chefs and employees were all working on developing the stuffing. Ultimately, Siems’ idea was the one chosen. Kraft, who now owns the Stove Top Stuffing brand, sells over 60 million boxes around Thanksgiving. 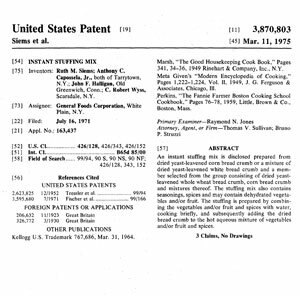 U.S. Patent No 5,758,569 was issued to Rodney Barbour for a Poultry frying apparatus on June 2, 1998. A frying apparatus is disclosed which is specifically designed for deep-frying turkeys or other similarly shaped food items. The frying apparatus has a central rod attached to a perforated plate that is used to support a turkey as it is lowered and removed into a large container of hot oil. 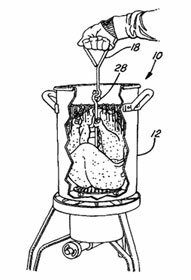 The frying apparatus also includes a grab hook that releasably couples to the central rod and allows a user to avoid burns from hot oil exposure when removing or inserting the turkey. 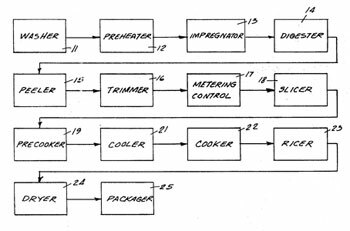 U.S. Patent No 3,574,643 was issued to Overton Machine Company on April 13, 1971 for a Method Of Producing Dehydrated Potato Flakes. The flake is a dehydrated, heavily processed potato that can be heated with water and fat and resembles home made mashed potatoes. ← Invention Geek – Invention of Stethoscope ?